Last week i was lucky enough to spend an afternoon playing with dolphins: learning about their habitat and lifecycle, how they are trained and looked after, how they each have a unique personality. I was able to learn some basic commands to communicate with them and to play, throwing a frisbee for them to fetch. Stood in the water, looking into their eyes, you feel a very personal bond, much like playing with a dog! It was great fun and not just for me: the children doing the same thing were clearly learning a lot and talking animatedly about conservation and recycling (big messages given to us as part of the intro talk on habitat). That evening, i posted some photos to Facebook, for my friends to see, and Ed came back to me with some challenges: his concerns were about keeping mammals like this in captivity, about how it can deprive them of their freedoms and that they can be mistreated when captured and trained. When i pointed out that they seemed very happy and well looked after, he was able to share with me some research showing that, at the very facility that i was visiting, one of the new dolphins had died in transit. Whilst it hasn’t particularly changed my views about keeping animals in captivity (if they are well looked after and have the right space) i am more aware now of other views (as Ed and Bob commented, it’s better to see them in the wild). I certainly feel that there can be great benefits when children (and adults) are able to interact with and experience a real connection with these creatures, that it can fire our desire to protect them better, but now i think i’d be more likely to peer behind the curtain, to ask more questions around how they are captured and transported. But what i was really interested in is this: wisdom in the Social Age. 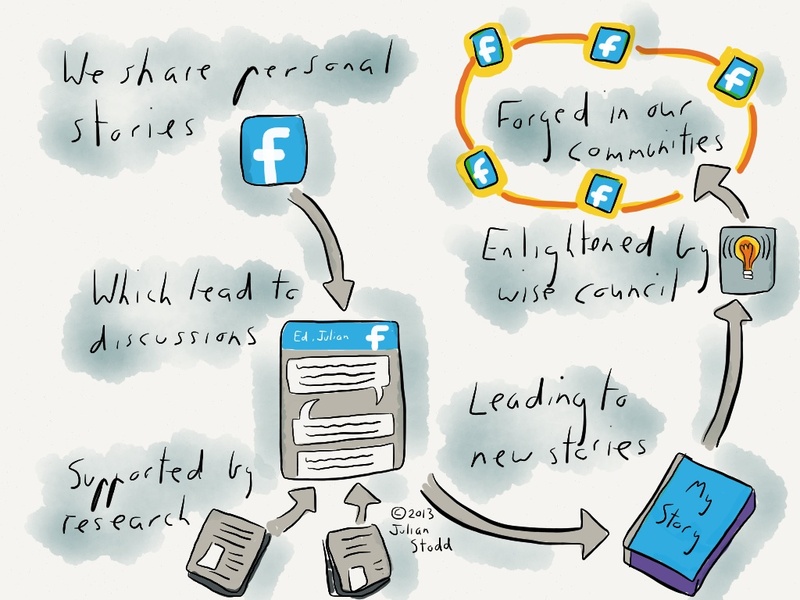 When discussing the use of social learning communities, i often say that the point isn’t to build consensus: it can be to identify differences, to explore that and to form a narrative around it. That’s exactly what we’ve done here: neither Ed nor i are likely to entirely reverse our position, but the discussion, for me anyway, has been enlightening and provocative, both good outcomes. My view of the situation hasn’t reversed, but it has changed. Wisdom is about experience and action: wise leaders are ones with a strong reputation, who are able to help build meaningful narratives around a subject and share them well. That’s exactly what Ed was doing: not telling me i was wrong, but putting forward a viewpoint and supporting it with data. He interpreted that data in the context of our discussion. We have not reached a consensus, but our very differences have allowed us to explore a subject and form a new narrative. The technology was incidental: it facilitated the discussion, but it didn’t cause it. The acts of sharing and storytelling did that. In the Social Age, our understanding of the world, our learning, is shaped and moderated within communities. They provoke us and help to keep us on the straight and narrow. We rely on them in our social and work lives, sometimes crossing over. The world is a big and diverse place, full of different experiences and views: playing with the dolphins enlightened me, it was a meaningful experience leaving me both happy and more determined to do more to celebrate and protect our precious resources. Ed may have a different view of this: that the same could be achieved in different ways, and that’s a viewpoint i respect. The conversation with Ed has been central to me creating the meaning out of the experience: i cannot view one without the other. And of course, the trait of sharing (a Social Age mainstay) got me into this conversation, so with this personal narrative, it takes me out again. Documenting a narrative of the things we disagreed on is every bit as valuable as sharing the consensus. Sharing our experiences, sharing the conversations, trying to find the meaning in the conversation, that’s what makes us agile learners. That’s how we try to develop real wisdom. This entry was posted in Agile, Conversation, Dialogue, Environment, Learning, Narrative, Reflection, Stories, Storytelling and tagged Community, Dolphins, Experience, Learning, Narrative, Social Age, Social Learning, Swimming with Dolphins, Wisdom. Bookmark the permalink.